A sceptical Mancunian who dislikes pomposity and rudeness. Every society contains stress between unifying forces and divisive forces, stress that increases with social complexity. Social cohesion is constantly threatened by the competing interests of different groups, some in direct conflict. Primitive, societies suffer the least stress because they are held together by strong, normative rules that are ancient, internalised, unwritten and unquestioned. As a society becomes open to change the need arises for explicit rules from a priest or other acknowledged authority. In post Norman-Conquest England cohesion was achieved through feudalism, in which everyone knew their place. As England opened further through trade in the fifteenth and sixteenth century feudalism gave way to rising individualism, leading to confrontation between King and Parliament. My argument for the preferential treatment of certain subjects in education met with an objection from some to ‘social engineering’. I find this puzzling. Do these people object to social engineering in principle, or to what has over the years been a primary objective of that process? If it is the former, they have a logical dilemma. One cannot object to the principal of ‘social engineering’ and protest about the government’s failure to control immigration, for example. If we view society as a complex entity in a state of constant transition we have to accept either that its shape is ‘engineered’ or left to random forces. If the former is thought preferable, we have to ask who or what should do the engineering. Historically, that has been done by governments and is, indeed, the rationale for having government at all. In my view, it is the principal responsibility of government to define a society’s strategic needs, and to determine the policies necessary to meeting them. That is simply what governments should do, and is the reason for our desire to have some democratic control over their activity. Recognising the need for that process does not imply support for the specific strategic aims a government pursues. For many years British governments of all stripes have pursued pseudo-egalitarian objectives, perhaps most closely observed in education. We witnessed the attack on grammar schools, for instance, by the likes of Anthony Crosland and Shirley Williams conducted in the name of social equality and fairness. Yet, while slamming the door in the face of bright, working class children, these people did not abolish the public schools, which were a much more evident symbol of inequality. It was, of course, a pseudo-egalitarianism that they pursued, but successive governments have continued to pay lip-service to this particular idol. I am bitterly opposed to such idolatry, but my objection to a specific objective or set of policies does not deny the legitimacy of government’s role in developing and pursuing strategic objectives on our behalf. I do not believe the slogan that less government is better government. Indeed, the reason we are presently in crisis lies in government failure to do its job. When I suggested recently that the level of university fees should differ according to the area of study, with science and engineering students being favoured over the arts, I was criticised as a philistine. At the risk of the accusation being repeated, I assert again the view that it makes little sense, vis-à-vis national strategy to treat all university subjects as of equal value. I find myself supported in that view in Dambisa Moyo’s latest book ‘How the West Was Lost’. She points to two features of education in the West as reasons why we are losing out economically in competition with countries such as China and India: egalitarianism and an aversion to science and engineering. Perhaps this explains why, in the eighties, when I was recruiting trainee managers from successful A level students, I had to include remedial education in English and maths in their training programme. As for the UK, GEC was struggling twenty years ago to find enough graduate engineers for its needs. Also, I recall meeting a British engineer in a French hotel some years ago. His machine tool company had been bought by a French rival and he was in France on a training programme. In conversation with me he expressed his astonishment at how much more advanced was the French company over his old outfit. So, wanting to see discrimination in the educational field has nothing to do with being a philistine, but a lot to do with being an economic realist. 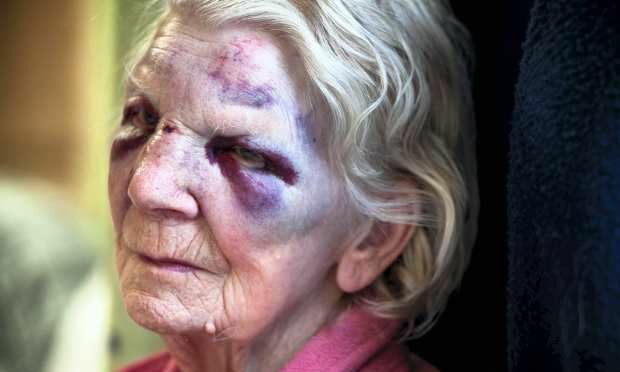 This is 92-year-old Edith Brickhill – kicked in the head and beaten black and blue on her own doorstep… for just £30. A callous thug pounced on the part-blind gran as she let her dog out at home in Moston. This is an area in which I grew up. What the hell ihas happened to our society? I unloaded my groceries onto the checkout conveyor and waited for the woman in front to pay. Glancing round I saw a man in his sixties with a can of beer in each hand. ‘Go on, then.’ I waved him ahead. He thanked me in a quiet, polite way and took his cans to the till. I weighed him up. He was clean, and his clothing was far from shabby, though cheap. I had seen him before, standing outside the same supermarket, drinking from a can of beer. Having paid, he nodded to me again, and left the store. As I emerged from the shop he was wheeling a bicycle across the car park. I loaded my stuff into the car and watched him from the corner of my eye. He had stopped by a concrete block on the edge of the car park, leaned his bike against it and opened a can. As I drove away, I could not help wondering about him. Clearly, he was not a tramp or a beggar, and was in no way rough. Yet, there he was, and had been before, standing alone on a cold day on a supermarket car park drinking his beer. Why? Did he live in a hostel where alcohol was forbidden, or perhaps he had a wife who would bend his ear for drinking at eleven in the morning. At the moment, I don’t have the answers to these questions, nor am I likely to find them in reality. I am fairly certain though, that I shall answer them to my satisfaction when I meet him again: in one of my stories. He was custom made to become a ‘character’. I have now been asked by two people, one of whom questioned my manners, to choose between posting here, or on MyT. Allow me to explain my position. To begin with, my manners are sufficiently well developed to prevent me from intruding where I am not welcome. I came onto this site relatively recently because I was advised by Rick that I would find on here some people with whom I had enjoyed communicating on a site now defunct. So, coming here allowed me to re-establish contact with some old friends, as well as making new ones. As for MyT, I have been on that site for some years now. There are many faults with it, and many people on it that I choose to ignore. However, there are many sincere people on MyT who respond to my postings, some agreeing with my views, some not. When I offer a view, I wish to contact as broad a population as I can against which to measure my opinion. Sometimes the response is strong on both sites, but a low response from one site or the other is common. Therefore, though I regret any offence or inconvenience caused, I intend to continue posting on both sites. I shall reconsider my position only if asked to do so by Boadicea, or by a significant number of other people using this site. Freedom in any civilised society is often a matter of compromise between conflicting interests. There may be cases where someone’s freedom can be enhanced without loss of it by another, and in such cases the enhancement is not contentious. However, I am greatly concerned by a case in which two homosexual men have been awarded damages against the owners of a private hotel who refused to allow them to share a room. The hotel owners claim to be devout Christians, and say that they would refuse a double room to any unmarried couple. The plaintiffs were supported in their claim by the Equality Commission, a quango resting on the public purse. In my view, this case is another indication that the freedoms of ordinary, law abiding citizens have been eroded to an unreasonable level. The Equality Act appears to provide a big stick with which discontented minorities can intimidate the rest of us. Can we be sure that scrapping that act, and the Commission, would, on balance, diminish freedom in Britain? I am convinced that it would not. Author tomkilcoursePosted on January 18, 2011 Categories General26 Comments on A Free Country? Two or more years ago I coined the term ‘Assured Corporatism’ to describe the system that had replaced capitalism as we knew it. Under AC organisations are considered too big to be allowed to fail and are bailed out with public funds when they begin to sink. This has been most noticeable in, though not confined to, the banking system. I argued that Northern Rock et al should have been allowed to go down the pan, with the State guaranteeing depositors’ money, but not that of shareholders. The fundamental error made by politicians and their advisors was to confuse banking as a function, with the organisations performing it. The function is critically important to economic wellbeing. That is not true of any organisation performing the function. When an organisation fails an opportunity is presented to other organisations ready to step in and fill the gap, having learned from the other’s failure. That is capitalism. Now, at last, a deputy governor of the Bank of England has come round to that view. Hindsight, as they say, is a wonderful thing. What a pity that it was preceded by such muddled thinking. I listened this morning to a discussion on the radio about the plan to give doctors power over budgets in the NHS. During the discussion, someone in favour of the idea mentioned that this would be an end to top-down management. I future, decisions would be made ‘bottom up’. I disagree. GPs are ont at the bottom of the pile. That space is occupied by the patient. Indeed, in the British system, the GP already has the power of gatekeeper to NHS services. In my view, that is too much power. It is already very difficult for patients to be referred to specialists. That situation will worsen as GPs weigh the cost of a referal to their budget. Interviewed a little later, David Cameron admitted that the UK health service performs worse than many other European countries, despite having about the same spend. Yet, in the same interview he expressed his devotion to the NHS, apparently unaware that this financial behemoth is the cause of Britain’s weakness on health. Author tomkilcoursePosted on January 17, 2011 Categories General16 Comments on Bottom Up? Really? Have I missed some news item, some incident in which radical Christians have destroyed a mosque, or massacred the people praying there? I doubt it, though am preparted to hear otherwise. I suspect that the phrase is the kind of dissimulation that the politically correct liberal uses to give an impression of balance.